The lost Devastator runs low on fuel. Historical note: this aircraft was a relatively poor performer. Designed in 1934, the Douglas TBD Devastator was most noted for its dismal role in the battle of Midway where 41 aircraft made no hits on enemy ships at all, and only 6 aircraft returned. It was immediately withdrawn from service and replaced. Against the Sun (2014), directed by Brian Falk, happened to be available to me for free, so I watched it thinking “Hey, that’s a TBD-1 Devastator! That was a terrible plane, no wonder they crashed!” Well, it wasn’t the aircraft’s fault. And its only a WWII film by technicality. Its actually a survival drama that happened to take place during WWII in the Pacific theater. Spoliers ahead, as usual. 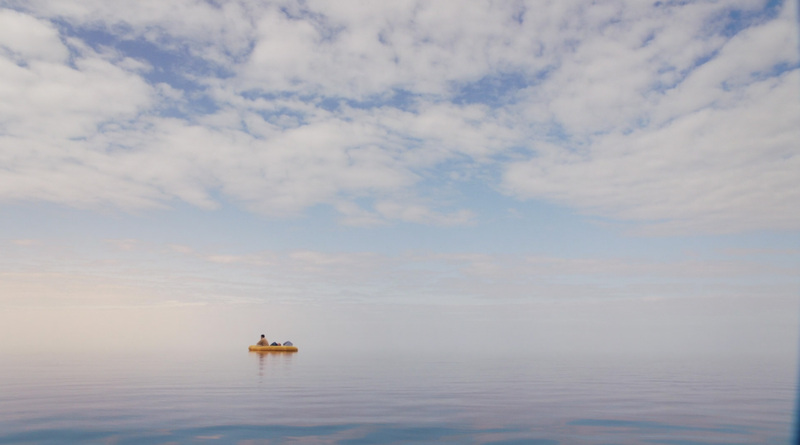 A lost-at-sea saga is compelling. But telling the same tale of seaborne survival over and over is now old-hat. This film pays proper and worthy tribute to three real aviators who survived 34 real grueling days at sea, but it does so as just another lost-at-sea tale. 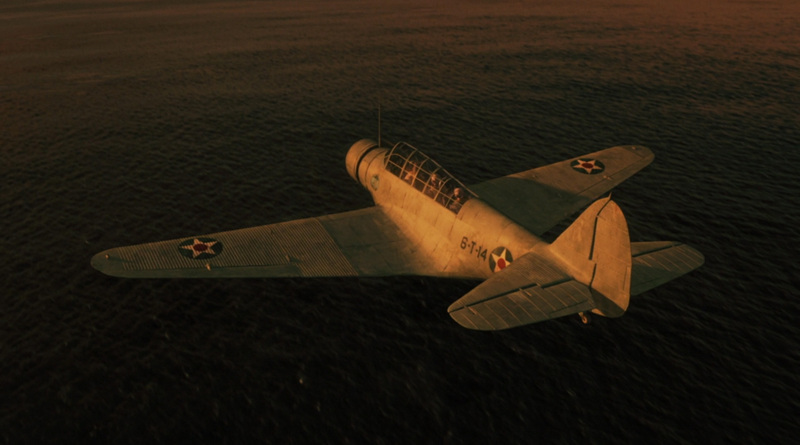 Ninety-five percent of the story takes place in a yellow three man rubber raft, the rest of the time in an unconvincing prop-shop cockpit of a TBD-1 Devastator torpedo bomber. What stood out about the production was that the film’s budget must have been pushing the three thousand dollar mark, maybe three-twenty five K. They had to hit up a local surplus store, at least. Clearly I jest, but the budget wasn’t spent on the in-flight CGI, that’s for sure. I’m not knocking low budget films. It was just evident in the CGI and overall production. There are always sharks. Sharks are very curious fish. They like good company. They like people. That is not to say it was not a film worth watching, but it certainly wasn’t much different than any other survival flick where castaways plied the oceans and improvised means of survival. The story follows the true story of a three-man crew of a torpedo bomber that, in returning to its aircraft carrier in the Pacific, gets lost, cannot make contact with the carriers, runs out of fuel, and has to ditch in the sea. The crew salvages a little of the gear they need, including a raft, but trials begin even as the raft it inflated, and the men are left with very little material. They have to learn to improvise, get along with one another, and keep hope alive. Throughout literature and film, such tales have taught us some basic lessons about survival. Some of these basic lessons are just common sense. So when the actors in a film violate what most folks know to be basic Survival-in-a-raft 101, it distracts from the story. This film had several of those distractions. For one, these naval aviators, one would presume, had to go through some rudimentary survival training in their brief training time. So it was rather unbelievable when they ditched some of the gear that had already made it into the raft, including their shoes. Shoes have many uses in a situation like theirs. It was unbelievable. Really. Second, the score. Particularly, the score when a shark came around. It was sort of a cheap rip-off to borrow low, menacing, staccato strings music when there were sharks about. I guess a filmmaker would call it paying homage to the classic Jaws – it was that obvious. But to me it seemed to just borrow what has become the standard cultural shark-score instead of being original. That says something for John Williams’ terrifying score for Jaws – it has become the cultural norm for menacing sharks, so much so that other films can’t find any other music. Weather is both friend and foe. In order to pull off a great in-the-raft drama, characters and their character must carry the day. This is where Against the Sun does a better job. “Chief,” the pilot, is a bit of a mystery for a while. We get to know him through his domineering personality and gruff, take-charge attitude We learn he has a guilty conscience though, it was his error got them in this predicament. The two crew members, barely out of their teens, are well acted and believable young men. I enjoyed the banter between them though it was awkward and campy at times. They managed their various personalities and tackled the challenges of a harsh environment, though rather flatly. They pondered, a little, the unlikely chance of rescue. There just did not seem to be enough mental challenge, spiritual conflict and physical trial. We know these men suffered deeply, heck, I had second degree burns all over me just from falling asleep in the Galveston sunshine for a few hours. These men suffered for sure! But we don’t see the weight of that suffering. It would have propelled the film into a more dramatic direction had we seen some more angst. Such extremes would have pulled us in more deeply, caused us to have more empathy for the men, and their ultimate victory would have been all the greater. I believe it was a good try, but feel a bit short. To summarize, when it became evident to me that it was a survival at sea flick (I did no research before-hand), I immediately expected the predictable – thirst, exposure, hunger, fishing, sharks, and poor decision making. The predictable happened, largely because that is what happens when people get lost at sea. I did pull for them men and found myself engaged. But had I been called away to a chore, I might not have turned it back on because it lacked the depth a great film needs. Been too long at sea. That is not to say it isn’t worth watching (I say, a second time). I’m just rather tired of survival at sea films, perhaps because I’ve seen them all and read dozens of similar stories in books. What the film has going for it is a compelling tale based on real life events, pretty good acting, and heroes we can root for. I did have the very refreshing realization that they movie was very clean, there was no foul language. That is a huge plus to me. I could show this film to my children without hesitation as an example of perseverance under trial and survival by improvisation. My boredom with such films doesn’t diminish this film’s good points. I’d recommend it if you need a family film about persistence. My personal, skewed, jaded opinion would rate this film a C-, but the clean language makes me kick it up to a B-. Other reviewers have claimed it is a first rate film, but apparently there are dozens of reviews by the same few people – that smells fishy. Like a promotion department somewhere isn’t covering their tracks well enough. You will have to make your own decision, I suspect you will enjoy it despite its flaws.